Need a few sensory gift ideas? 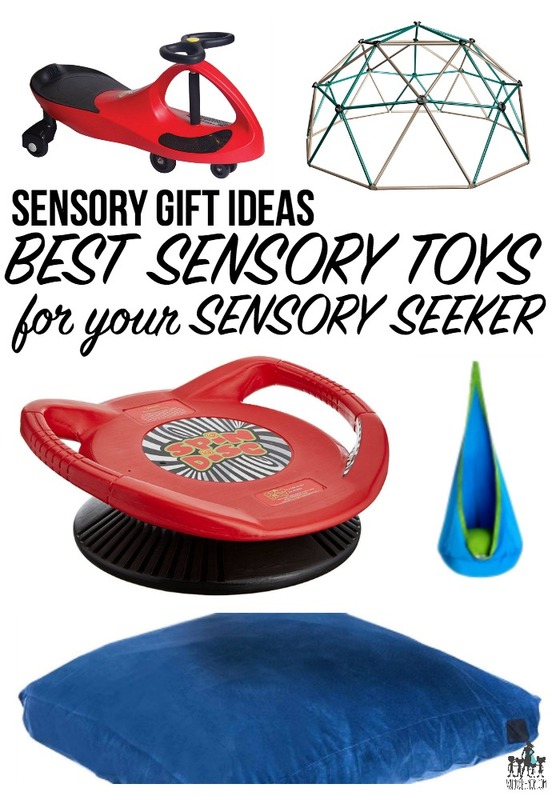 This gift guide if full of sensory toys for kids and the best gifts for sensory seekers. As the awareness and understanding of Sensory Processing Disorder increases, so does the amount of products out there for sensory seekers. There are some really fun sensory toys for kids available these days that your sensory kid will love and that will help them regulate their bodies. We have several sensory seekers in our home, proprioceptive seekers to be exact. They love to climb and hang, crash and jump. Without the right sensory toys in the home, though, this can be extremely destructive! They might resort to climbing couches, jumping on furniture cushions or hanging from window treatments. Making sure they have the right tools to safely get the sensory input they need is a great idea. When it comes to shopping for birthdays and purchasing holiday or Christmas gifts for sensory kids, we like to purchase fun sensory toys that they can use throughout the year that will give them the sensory seeking opportunities they need. So many regular backyard toys, are exactly what your sensory kids needs. These are larger items that work great for some outside sensory time. A must have is a Trampoline for jumping. A 12′ backyard option is great for the older sensory kids that just need to jump! We also love this climbing dome and swing set for when they really need to move their bodies. For an all in one option the Lifetime Adventure Tower play set is amazing. Pogo sticks, scooters, and ride ons are all great sensory gift ideas to use outside also! The indoor sensory toys are even more important to have. Sensory seekers need to get the movement they need all day long – even in the evenings after dinner or on a snow day. Having sensory toys in the home can be a huge help to our sensory kids! We keep a small fitness trampoline in the family room. This is an affordable option and also great for the sensory seeking toddlers and younger children that can’t safely use a large outdoor trampoline. Having a crash pad is also a great idea. It will save your couch cushions for sure! Kids can use it for laying on or jumping into. An indoor sensory swing or sensory pod is another great sensory gift idea. Your kids can use these inside when they need some vestibular input. A spin disc is another fantastic vestibular sensory toy that the kids can use inside. If your kids love to hang and swing then the Doorway Gym is a must have sensory toy to have in the house. Additional items that are great to have in the home are tumbling mats and weighted blankets. Need more Sensory Gift Ideas?